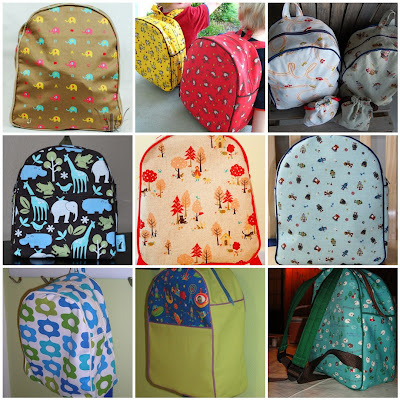 From the sudden increase in toddler backpack pattern sales over the last couple of days, it seems many of you have decided it’s time to sew your kiddo a backpack so they can be stylin’ as they hop off the bus. Be sure to post them to the Toddler Backpack Pool (along with modifications, suggestions, and the fabric you used) so that we can all enjoy your handiwork! I got such a thrill out of seeing my son's little backpack on your blog today. (green, bots and rockets) Thanks for that. Oh Wow…I also had a little thrill seeing my backpack on your blog (Little Red Riding Hood). Loved the pattern and love your blog! Ohhh, I remember that panicked feeling when my husband went back to work after #2! Love seeing all the backpacks! my friend called me up and said "your boys are on raes site!" yea, how fun, thanks for putting my backpacks up, and for the link I have already received one response…hope it leads to more. good luck this week home alone with the kids…I know you will be fine, you'll find out that your older child can do alot for you if you just ask. Don't worry Rae, my little one is 6 mos and the big guy is 3. I was sooooo scared when hubby went back to work…..but you know what, I've done so much sewing in the last 5 months it's insane!!! I don't know if it's crazy hormones or what, but I'm expecting you'll do just fine! I LOVE your site! I don't sew, but wanted to start and just made your licketysplit bag and LOVE it! Thanks so much for making something so adorable so accessible! I'm glad you're taking a break from physics so I have something to sew! i've GOT to get mine made! Good Luck without Mr Rae! I will be selling the backpacks from my site, which I'm launching Next Saturday. although, I'm in Australia, so not always much help lol. Not sure if you will get this….however I love your blog…just found it! I would like to purchase your backpack pattern but wondered if you did a pdf version too and does it include instructions for a lining?